In the History of Cultured pearls, the name Mikimoto pearls stands out from the crowd of Cultured Pearls. The modern history begins with the legendary Kokichi Mikimoto, a Japanese marketing genius, who leased one thousand acres of sea bottom in Ago Bay in which he farmed one million Akoya oysters and produced an annual yield of between 30,000 to 50,000 cultured pearls! An insider's account of the history of Mikimoto Cultured pearls is most interestingly retold, by talking with a few of the oldest employees of Mikimoto pearls, the world's most famous pearl manufacturer, about the early Mikimoto days. They still remember seeing their fierce company founder, telescope in hand, scanning the waters below to see if any of the Japanese pearl divers were slacking off, on the giant wooden floats that support baskets full of busy bivalves. On the wall of Mikomoto's living room, largely untouched since the day he died in 1954, are pictures of the Three Emperors and Empresses who received his Akoya cultured pearls as royal gifts, and proclaimed him a national hero. Produced by Japan's Akoya oysters, the beauty of Akoyas are undeniable. Akoya oysters have the amazing power to produce almost perfectly round cultured pearls consistently. To give credit where credit is due, in the modern history of cultured pearls, it might come as a surprise that Kokichi Mikimoto was not the first to actually culture pearls. Kokichi Mikimoto was the first to perfect the process and to successfully market cultured pearls to the world. A reliable source from down-under, indicates that in the history of cultured pearls, it was an Englishman, Mr William Saville-Kent who discovered the culturing process first. Ask the Pearl Guru HERE! In the history of cultured pearls, the primitive cultured pearling techniques go a long way back to the third century. Philostratus, a Greek writer (well, I did say a long way back) gave credit to the Arabs and Persians of the Red Sea with their knowledge of growing pearls artificially. Certainly the Chinese were producing pearls by artificial means many centuries ago. They inserted pellets of powdered seed pearls into the open shells to form a core for the deposit of the natural secretions of nacre. In the 18th century the Swedish naturalist Linnaeus wrote that he had discovered how pearls originated and claimed that in the course of five years he could produce in any mother-of-pearl shell, pearls as big as peas. Interestingly, the Linnaean Society of London possess some of these very early cultured pearls and manuscripts which detail the secret process the naturalist followed. In 1884, similar experiments were made at Tahiti. Here the pearl farmers drilled gimlet holes about half an inch in diameter in the shells of pearl-oysters and inserted pellets of nacre or glass held by brass wire passing though a cork stopper which closed the gimlet holes. The oysters were then returned to the sea and when examined several months later were found covered with thin layers of nacre. Early in the 1890's G.S. Streeter began a similar experiement in Roebuck Bay, Western Australia. Streeter drilled the shells and inserted studs of mother of pearl with a knob projecting inside the shell. The result was excellent pearls. Local prejudice and the Western Australian Government's concern for the future of the Natural pearl industry stopped the experiment, which was repeated in the lagoons at Monte Bello Island, where Streeters had a pearling station. Meanwhile the Chinese and later the Japanese followed similar processes. They used nuclei of various shapes and materials, mostly spherical pellets of nacre. In the history of Cultured pearls, Kokichi Mikimoto with a heart of oak, established the Japanese cultured pearling industry, redefined the entire landscape of the pearling industry while perhaps unknowingly added an even more desirable characteristic to rare Natural Pearls. Yostin "Justine" Lissette Pasek Patiño (born August 29, 1979) is a Panamanian model, FAO Goodwill Ambassador, and Miss Universe 2002. 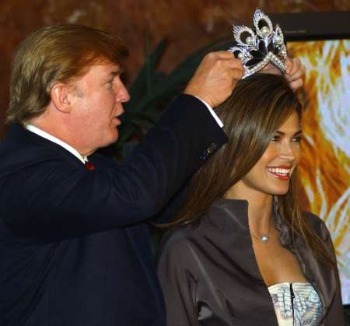 She was formally crowned Miss Universe 2002 by pageant co-owner Donald Trump in New York City, and a busy week of press engagements followed. Pasek also received an elaborate Mikimoto pearl encrusted crown, worth $250,000 as well as an extensive prize package.